Lee Mack is a BAFTA-winning English stand-up comedian and actor, known for his role in the BBC One sitcom Not Going Out as well as being a team captain on Would I Lie to You, a comedy panel show hosted by David Mitchell. His high energy banter, well crafted gags and sharp one liners are the reason why Lee Mack tickets sell out. Eventim is the place to find Lee Mack tickets and tour dates. To be the first to hear when more Lee Mack tickets go on sale you can sign up to the Eventim Ticket Alarm below. Lee Mack tickets at Eventim.co.uk - your link to everything Lee Mack - concerts, tours, tickets, news and reviews. Lee Mack was born Lee Gordon McKillop in August 1969 in Southport, Lancashire, and is now a stand-up comedian and actor. As a boy, he moved to Blackburn when his parents separated, and after leaving school worked in a bingo hall and as a stable boy looking after Red Rum. He joined Pontins as a blue coat, and was sacked from the Yarmouth camp after calling a member of the audience an offensive name, but he did manage another six months at Pontins in Morecambe. He had various jobs before settling to study at Brunel University, and while there did his first open-mic slot in 1994. He was hooked, and less than two years later, he was working full-time as a comedian. The following year he gained attention when he won So You Think You’re Funny, at the Edinburgh Festival Fringe. Since that time, he has played the part of Graham, a security guard, in The Mighty Boosh, as well as hosting his own programme on BBC Radio 2 called The Lee Mack Show, and was also involved in ITV’s The Sketch Show. Other TV appearances include They Think It’s All Over, TV Heaven, Telly Hell, and as a team captain on Would I Lie To You? a BBC panel game. Lee has also hosted Have I Got News For You on three occasions. The BBC broadcast his first sitcom, Not Going Out, in 2006. The project was written with Tim Vine, in which Mack plays the central character, Lee. The sitcom will return to BBC in 2010 for its fourth series in late autumn. It has won great accolades, including a Rose d’Or and RTS Award. In 2006, Lee Mack tour tickets went on sale, and he recorded his first live DVD at the Bloomsbury Theatre. The DVD was released in 2007. Lee Mack is back on the road again in 2010, so check out the best Lee Mack tickets for cheap Going Out tickets when he tours the UK. 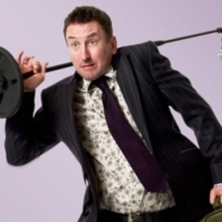 The show was planned to run from October 2009 to May 2010, but extra dates have been added for November 2010, as Lee Mack tour tickets have been sold out well in advance.